Now in its second year of publication, Anthro/Zine is the undergraduate companion to Anthropology Now. Each new issue, published under a Creative Commons license, is released online to coincide with the journal — April, September, and December. 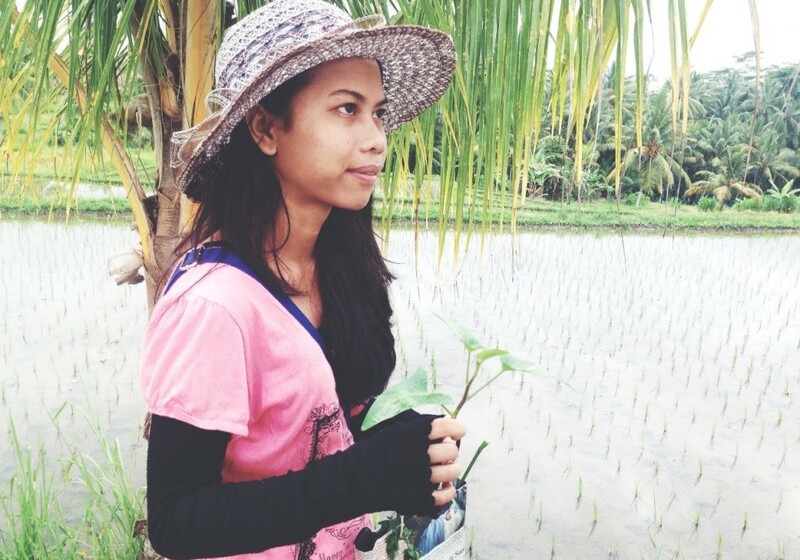 Anthropology Now welcomes student author Emily Crawford, whose essay on plants in Bali, Indonesia, appeared in the April 2016 issue of Anthro/Zine. Emily is an honours student in Environmental Humanities at the University of New South Wales. She has a particular interest in experimental ethnography and cultural anthropology that seeks to free multiple non-human species from the backgrounds of mainstream anthropology. She also majored in Fine Arts and is interested in the potential of art and various forms of ‘artivism’ to ignite curiosity, imagination and engagement in complex topics and issues. Ubud, Bali, Indonesia. Motorbikes, offerings, women carrying woven baskets on their heads, tourists slinging cameras keen to paparazzi commodified culture at dance performances, tourists perhaps more in abundance in this corner of the island carrying yoga mats and sipping Jamu (an Indonesian medicinal drink consisting of Turmeric, lemon and tamarind). Dogs roam and own the streets and hotels and home-stays are found at every turn and corner. I came here three years ago and was sad to discover the music and culture hub “Jazz café” had closed down, a multistory hyper modern hotel constructed next door. What else has changed since I was last here? Balinese spirit and culture stays strong through many storms, and continuing development creates no fallen branch on the path to the temples for their many ceremonies, but the island is also in a constant state of change. A Balinese couple I befriended last time moved on from the area, calling it “VIP.” Rental prices soaring mostly based on foreign interest. My current research is based on an ethnography of plants, plant agency and sites of plant/ human co-mingling as well as artistic collaborations, so while mulling over cultural changes in the area, I decide to turn to the plants. The sheer abundance of greenery in the tropical jungle here is psychologically nourishing even for those who suffer ‘plant blindness,’ a side effect of human exceptionalism where plants are seen merely as a background to life and not consciously acknowledged. Everywhere I walk here, I’ve become acutely aware of giant leaves and small soft vibrant flowers brushing past me, the gentle thundery sound of it. Mosses and small plant contortionists grow on most human-made structures, the thick humid air and daily rain ensuring wild flourishing. I came by Nadi Herbal by accident, looking to escape the frenetic traffic of Raya Ubud, wandering up a random road to a small shop selling herbal medicine and cosmetics. Vibrant and friendly Lilir, owner, ushered me inside and began pouring various oils on a motorcycle wound I’d acquired and feeding me tea of Tulsi and ‘cat’s whiskers’ – good for the immune system and kidneys she says. Her booming smile and clear eyes suggest she takes a healthy dose of plant medicine and perhaps spends a lot of time among plants. I mention to her my interest in plants both anthropologically and in emerging research into plant intelligence, plant agency and liveliness. “Well you must come on our herbal walk!” Lilir and her husband, Westi, are both students of traditional Balinese medicine and Ayurderic medicine and also possess knowledge passed down from their parents who are both village healers, plants being the vital ingredients in the making of offerings and for medicine. She tells me one of her main motivations is to hold on to traditional Balinese medicine, with many people now, especially the youth, turning to pharmaceuticals as a quick fix. She says the health of the soil is also a concern, where rice farmers are increasingly turning to non-organic methods and compromising the rich black wormy soils of the past (and still often, present). Taking her up on the offer, I hand over 200,000 rupiah for the tour and the following day I’m darting through tour buses and men offering “Taxi! Taxi! Cheap! Cheap!” on Raya Ubud to meet for the tour in front of the Puri Lukisan museum. I’m late, and my new addiction to Indonesian ‘koppi’ is to blame. Finding no one in front of the museum, one taxi driver points me towards a tiny opening between touristic restaurants, a small narrow overgrown path. Has this always been here? Entering the muddy, rocky path with high concrete walls either side, unruly vines close the gap even tighter. Winding around several corners I begin to feel a claustrophobia setting in. Could this really be the right way? I pass through a small swarm of dancing dragonflies and eventually emerge into rolling rice fields surrounded by pockets of jungle, water sitting in the plateaus of rice look like a mosaic of mirrors for the sky. The sound of traffic has completely faded, replaced by the sound of flowing water, intricate irrigation systems called subaks where water flows through the fields and ends up arriving at temples. Water that is viewed as holy. Slowly shuffling rice farmers peacefully swing machetes with woven triangular hats, sinking their legs knee deep into mud while they plant. I see the tour up ahead, and am surprised to meet Iluh, the 19 year old tour guide. She is showing the group how to blow tiny floating bubbles from the broken stems of Castor leaves, and wears colorful socks with her thongs. “When I was small we had no TV, so this was very fun for us. We also cut the Frangipani tree and use the sap as glue to put on a stick and catch dragonflies to eat!” Her playful nature meets an impressive interest and knowledge of plants for a young woman. Curious and intensely focused on the plants, we spend the next three hours deep in the rice fields, far more abundant with generous plants than one would imagine. Walking slowly, crouched towards the earth, our eyes flicker through micro floral worlds and water droplets shimmer amongst the layers of green as though we are searching for precious relics lost in the haze of fast paced modern life. Interestingly we learn that a small glowing white flowering plant known to Iluh simply as ‘white star flowers’ can be soaked in water and used to wash the impurities of pollution from ones eyes. Understanding includes a haptic vegetal sign language. Pointing, touching, and tasting our partial translations across language and species lines. 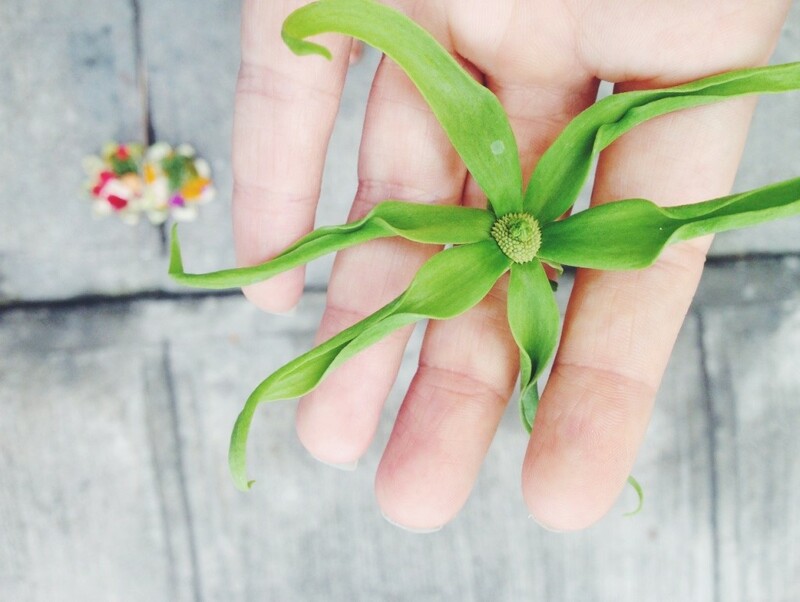 We use our senses to greet rambling ylang-ylang and magnolia, both important in Balinese prayer. 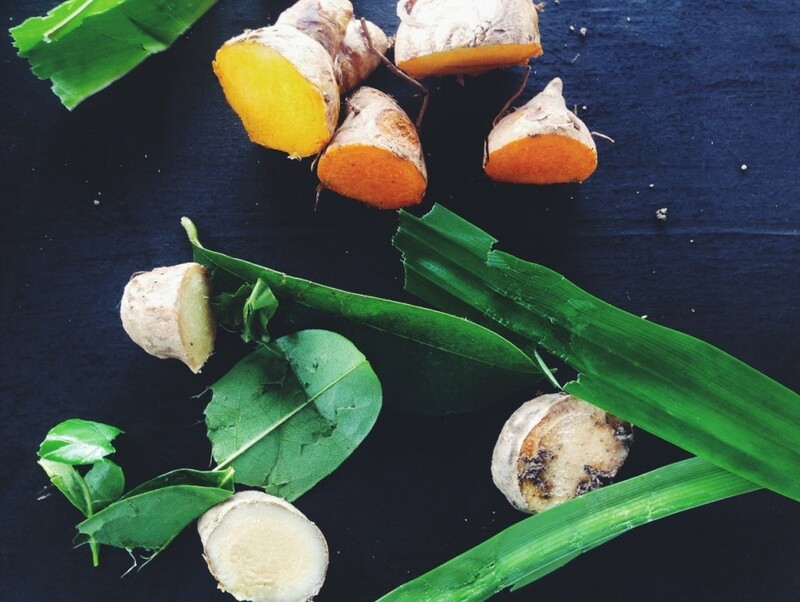 Scrunching small samples of leaves, we inhale deeply the aromas of kefir lime, pandan, clove, annona, the sweet unexpected smell of turmeric leaves. Iluh’s knowledge of plants is only halted by my questions of invasive plants, vines that appear to be colonizing sections of forest and algae’s amongst the rice, describing them only as “parasite.” I wonder if the same method of waging a war on all non native ‘weeds’ and the questionable desire to return to pre colonial ‘wilderness’ is a discourse with any weight here as it is in Australia and many other post colonial nature-cultures, but I get the sense that Balinese are not so stagnant in their view of nature, or culture. Iluh tells me that ‘wild passionfruit’ is “not really native, but we like it very much,” as she strokes one of the leaves by the side of the path, a vine that is noticeably taking control of the space. 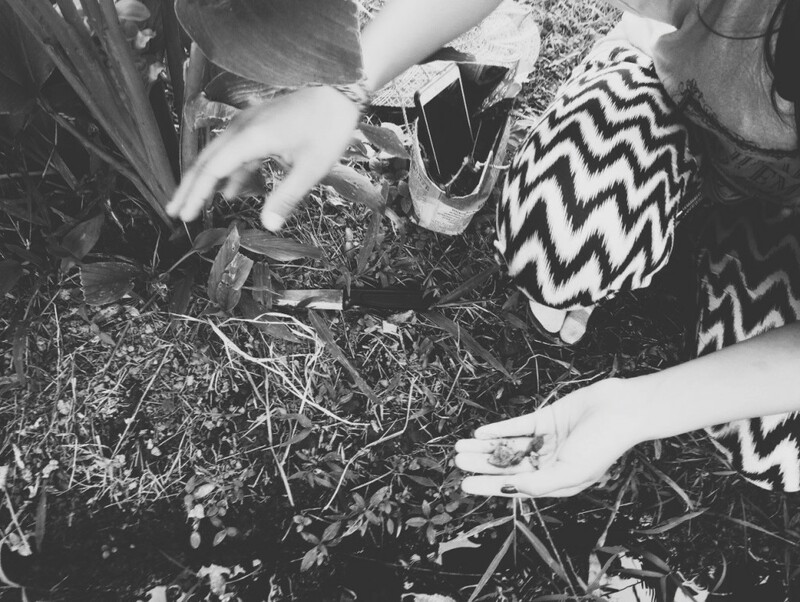 Perhaps foraging the plant, while still respecting and being thankful for its generosity, is a form of management. Balinese make gratitude for plants official during a ceremony that happens once every six months called Tempek Uduh. Offerings are dedicated to all vegetal life on this day, placed at the foot of trees, gardens and rice fields to show gratitude for the generosity and life giving value of plants, and to pray for more nourishment and abundance, a giving force the Balinese are acutely aware of as crucial to their survival. Though the Balinese may not necessarily agree that plants are intelligent agential creatures, they certainly practice an active acknowledgement and gratitude for plants and their unique liveliness, demonstrating somewhat of a kinship across species. The common word Balinese seem to use when referring to nature and plants is “mother.” Indigenous perspectives and TEK (Traditional Ecological Knowledge) is often inappropriately romanticized or assumed to be “in harmony” with nature, homogenizing highly diverse groups of people. TEK should never be seen as fixed and unchanging, however, there is still immense value in turning to TEK in the face of so many environments facing neocapitalist development and destruction. (So very close to this peaceful place amongst the rice and medicinal jungle on the Indonesian islands of Sumatra and Kalimantan, fires raged across unimaginable areas of forest just last year, and continue to devastate ecosystems and their people across the country, mainly caused by slash and burn farming.) In another way, just as a mistake is made by trying to erase the differences that exist between each community and within communities regarding TEK, differences between species may actually be a site of communion. Departing from the colonizers tendency to erase difference, Rosemary-Claire Collard (et al) suggests in “A Manifesto for Abundant Futures” that working towards more abundant futures requires a building of responsibilities and relationships that embraces vast differences, borrowing the concept of walking with from the Zapatista movement to describe the need for solidarity between species. Literally walking with the plants in this small corner of jungle, we enfold ourselves with ancient farming methods and medicinal kinships, cosmopolitan “parasites”, the smoke haze of development, and curious humans from many shifting cultures, landscapes and histories. When the only way is forward, to learn, taste, touch and be affected by plants and their entangled humans and cultures may be a small act of protest. A moment to consider futures beyond human exceptionalism and beyond narrowly neoliberal development and its often destructive outcomes so we may cultivate respect for plants and non-humans, and make way for more abundant futures. This entry was posted in Online/Exclusives and tagged Anthro/Zine, Bali, ecology, ethnobotany, plants. Anne Szabla’s Bird Boy follows the story of Bali, a 10-year-old Nuru boy who is keen to prove his worth to his tribe. After being banned from the ceremony that would make him an adult, he stumbles upon a legendary weapon and must flee across a dangerous land of gods, men and beasts to prevent it falling into the wrong hands!